Dress your tables for Spring with these delightful linens. 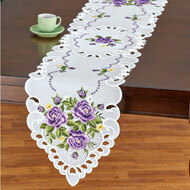 Charming purple tulips and butterflies are beautifully embroidered atop a white background. Perfect on their own or with a coordinating tablecloth underneath (sold separately). Machine washable polyester; imported. Available in: Runner (68 1/4" x 14") or Square (34"Sq.). 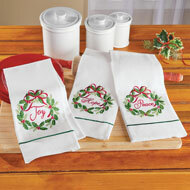 Embroidered with intricate holly wreath designs, this set of 3 festive towels add some holiday charm to your kitchen. Each showcases a red and green wreath with a different seasonal wish in the center. Hand wash. Polyester; imported. Each 17"L x 27"W. Set of 3. 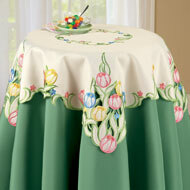 These festivelycolored table linens dress and protect your table with charming style. 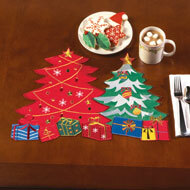 Perfect all season long, choose the set of 4 Christmas tree placemats, the tree runner or both for a coordinating set. Machine wash. Polyester; imported. 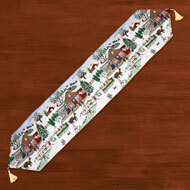 Size available in Runner (67"L x 14"W) or Placemats ( 19"L x 14"W). These charming and festive linens protect your table and make the perfect seasonal table decoration. 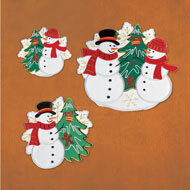 The fun designs feature smiling snowmen and decorated Christmas trees. Machine wash. Polyester; imported. Choose: Runner (69" x 13") or Doilies (6", 8" and 11 1/4" Dia., set of 3 doilies). Add a bit of sunshine to your tables with these lovely linens. 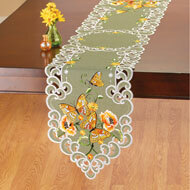 They feature embroidered flowers with charming butterfly accents. Intricate scrolling cutwork and a lovely khaki linenlike background make these a stunning way to dress your table. Perfect alone or with a tablecloth underneath (sold separately). Machine wash. Polyester; imported. Choose: Runner (69" x 13 1/4") or Square (34 1/4"Sq.). 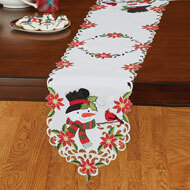 This charming snowman design features holly leaves, poinsettias and bright red cardinals atop a white background. These linens feature exquisite embroidery, lacy openwork and delightful details. Perfect on their own or with a coordinating tablecloth underneath (sold separately). Machine wash. Polyester; imported. Choose: Runner (67" x 14") or Square (33 1/2"Sq.). A cheerful sunflower design makes these charming linens a beautiful way to warm up your table. 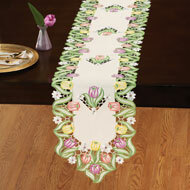 Choose the runner, set of 4 placemats or both for a complete set. 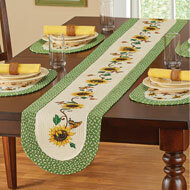 Each piece features sunflowers and butterflies atop a cream background, with a green and cream braided border. Spot clean. Polyester and polypropylene; imported. Choose: Runner (58"L x 13"W) or Placemats (18 5/8"L x 12 1/2"W) Set of 4. Set your table with these adorable table linens and bring an instant touch of summertime charm to your home. 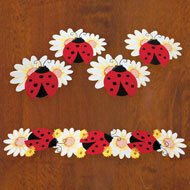 Available as a table runner or a set of 4 placemats, each features bright ladybugs surrounded by embroidered daisies. Machine wash. Polyester; imported. 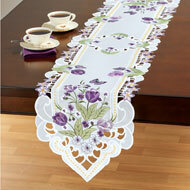 Size available in Runner (67"L x 13"W) or Placemats (20"L x 16"W). Add a bit of bright sunshine to your tables with these unique linens. Available as a runner or a square, the linens feature beautifully embroidered sunflowers with charming bluebird visitors. Intricate lattice cutwork and a lovely blue background make these a stunning way to dress your table. Perfect alone or with a tablecloth underneath (sold separately). Machine wash. Polyester; imported. Available in Runner (68 1/4"L x 13 1/4"W) or Square (34"Sq.). 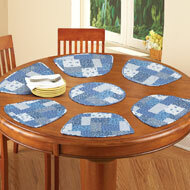 This charming placemat set features a lovely patchwork print in white and blue. The set includes 6 placemats that are designed to fit the curves of round tables and a circular mat for the center. Machine washable. Polyester; imported. Placemats are 19"L x 13 1/2"W, center mast is 13 1/2"Dia. 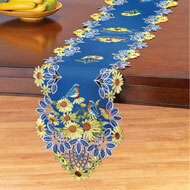 This beautiful tapestry runner decorates your table with bright color and a lovely design. The runner features a charming winter village scene complete with Christmas trees, carriage rides and snow covered stores. Cream tassels at each end are the perfect finishing touch. Machine wash. Cotton and polyester; imported. 69 1/4"L x 13 1/2"W.
Perfect for holiday baking, decorating or crafts, these festive cobbler aprons feature charming holiday designs. 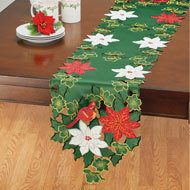 Select beautifully embroidered cardinals, poinsettia or snowman. 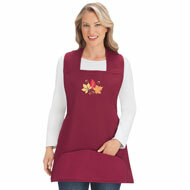 Each apron has front pockets and a tie in the back. Machine wash. Cotton and polyester; imported. Approx. 31"L. Colors available in Red, Blue or Green. Sizes available in M(1012), L(1416), XL(1820) or XXL(2224). 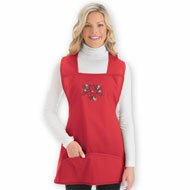 Perfect for cooking, decorating or crafting, these festive cobbler aprons feature charming fallthemed designs. Select beautiful fall leaves, a jack o' lantern or chickadee on a pine branch design. Each apron has front pockets and a tie in the back. Approx. 31"L. Machine wash. Cotton and polyester. Choose Burgundy with Fall Leaves, Black with Pumpkin or Ivory with Chickadee. Sizes available in Misses: S(68), M(1012), or L(1416) and Womens: XL(1820), or XXL(2224).